Go anywhere, the world is your trail. 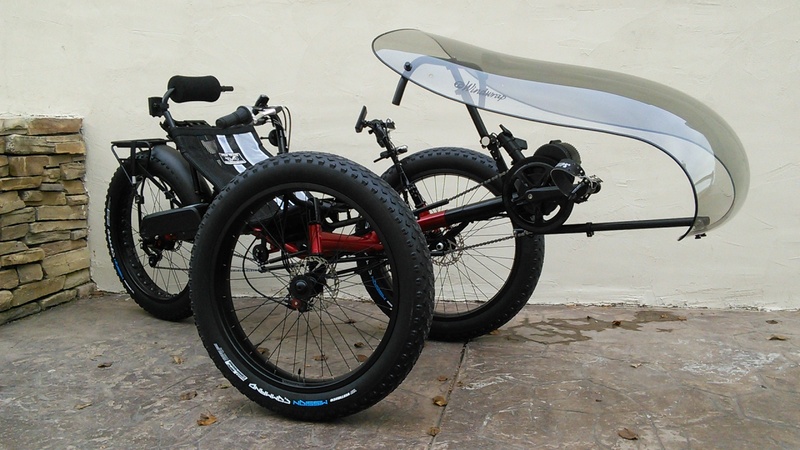 The Fat Tad Crawler FS is a new spin on our popular off-road trike. Our Fat Tad Crawler meets our Full Suspension Defiance. 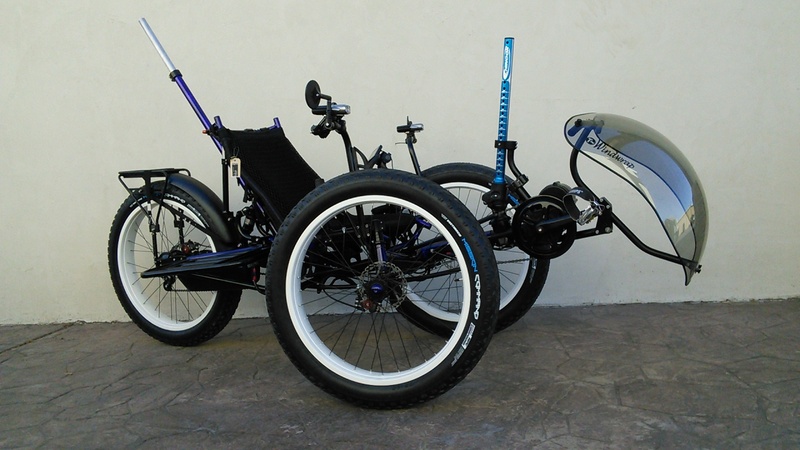 This trike offers the smoothest ride available in its category, bridging the gap between high quality and value price. 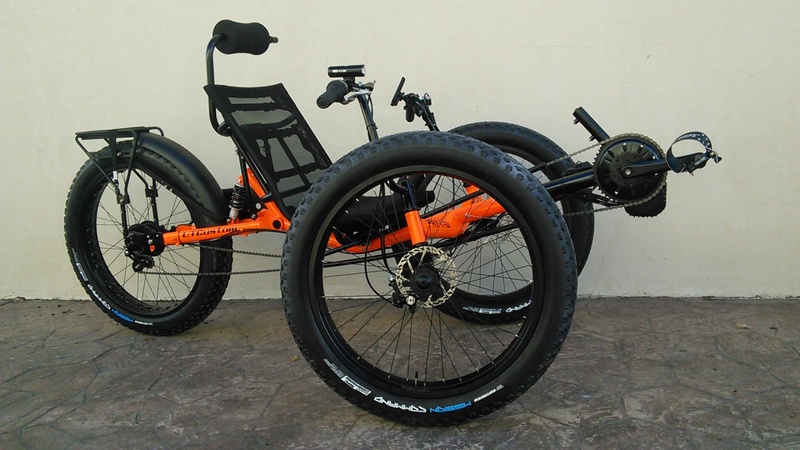 With a slew of upgrade options, this is a great platform to build your dream full suspension fat recumbent trike. 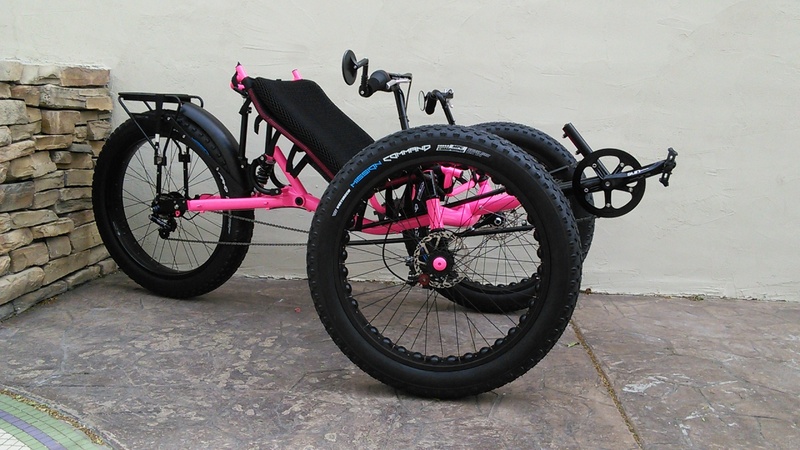 It features a durable steel frame, 300 pound capacity and adjustable custom mesh seat. 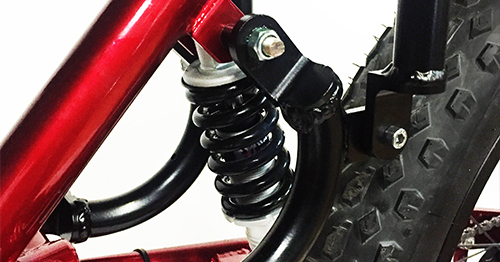 Get traction, suspension, durability all in a package that just looks awesome. 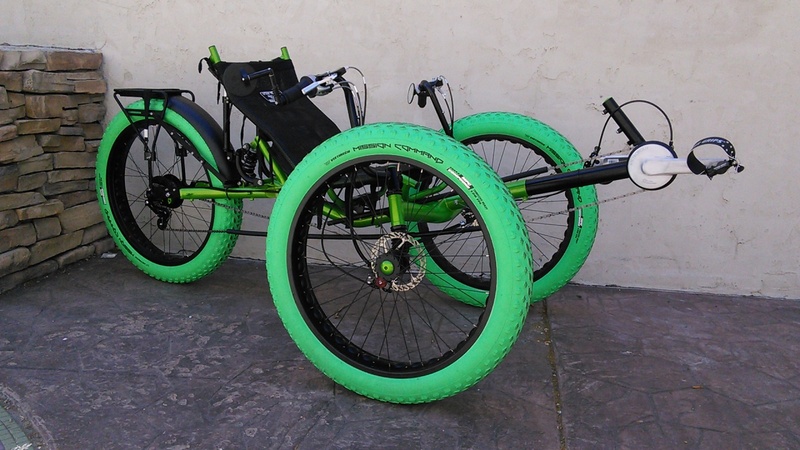 Check it: 26x4-inch Vee Mission Tires with nearly a 30-inch diameter. Designed for fat-bike riders who really want to haul, the Vee Rubber Mission tire is 4-inches wide to give you a ridiculous amount of float. This tire is built for speed and cushion on hard packed surfaces. Its ramped knobs create great traction without slowing you down on the loose stuff. 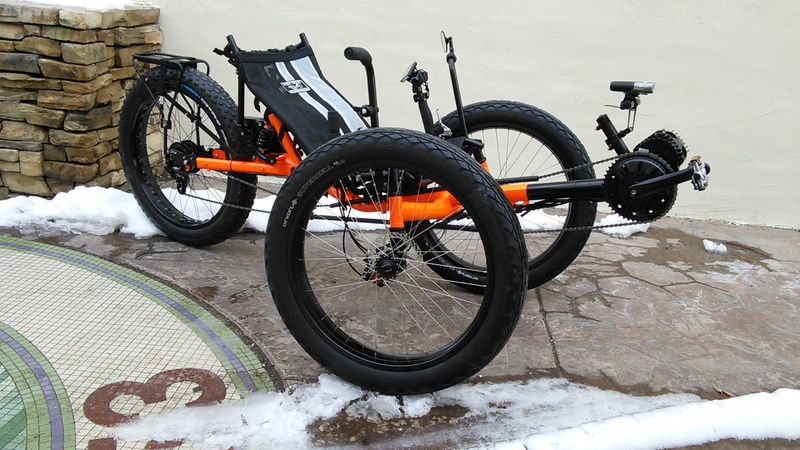 With this trike you get two types of suspension: active and passive. 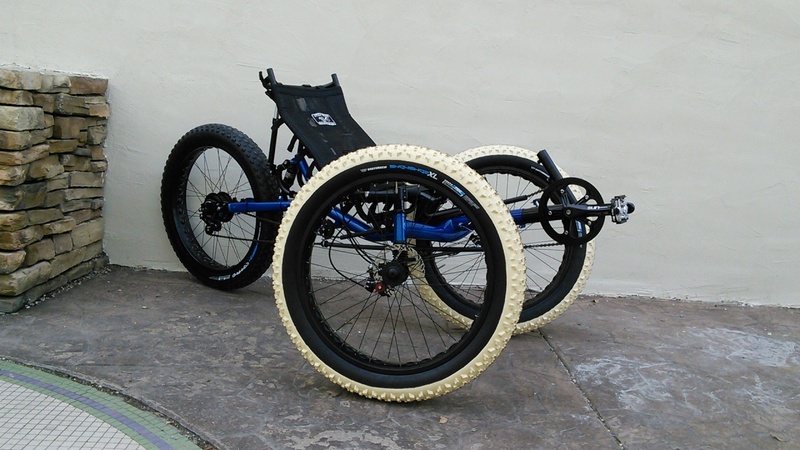 By controlling the air in the tires, the Crawler FS benefits from passive suspension on the smaller trail obstacles. 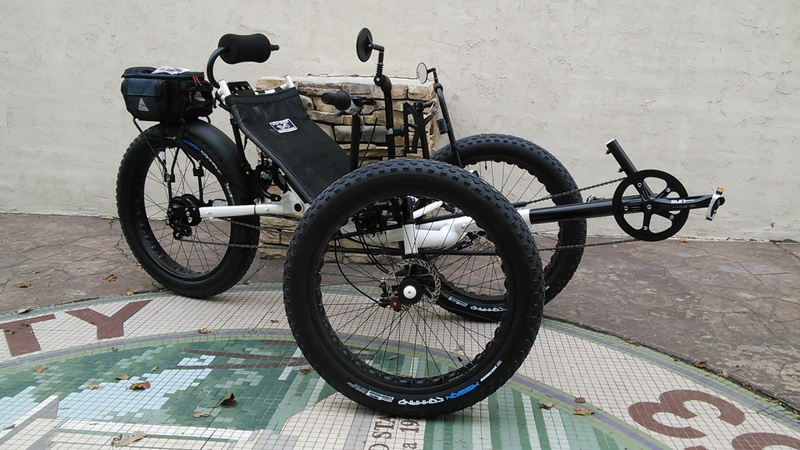 Additionally, we have built in full active suspension as well. The Crawler FS comes stock with a DMN Torch Shock in the rear, and features custom spring shocks in the front to offer maximum comfort. With our all-wheel suspension you'll also increase traction, giving you more control when you're out riding. This fully suspended monster makes curbs, trails, and uneven terrain feel like you're riding on clouds. For even more rear suspension travel and tunability we can outfit your Fat Tad Crawler FS with a Rock Shox Monarch Air Shock. The Frame is made to last. Chromoly Steel will help pick up any reverb from the trail and is incredibly durable. The adjustable aluminum seat is designed to sit in one of six optional locations depending on rider height. Additionally, the rear seat supports allow for infinitely adjustable seat angle using velogenisis clamps to ensure a rigid connection with no seat sway. 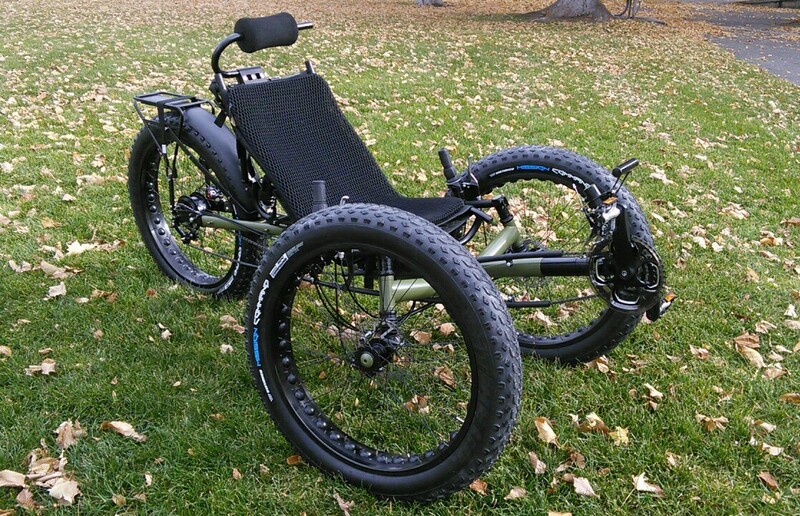 The Utah Trikes Custom seat mesh includes a pocket to carry your travel pump. Optionally, you can upgrade to our Performance mesh which adds a cargo pouch, insulated bladder pocket, and racing stripe. Standard Gearing Single 38T Front Chainring Paired with a Shimano Alfine 8-Speed Premium Hub. These is a great starting platform. Do you need more gears? Consider some of the other options below! Metro Drive: Is a dual drive component from 28t to 45t. The Patterson Transmission delivers rocket fast front shifting every time. This invention will change the way you ride your bike. Now you can use your front shifter any time to get the gear you want right now. Secure and precise. Unaffected by pedal speed or load. Once you try it, you will never go back to multiple chain rings again. Schlumpf High Speed 27/68: is an internal gearing solution that uses planetary gears to increase the rotational speed of the chain ring compared to the crank arms by 250% when engaged. When disengaged, the cranks are effectively locked to the 27-tooth sprocket. With such a wide gear range, the HSD completely replaces the front chain rings, derailleur, and shifter, even though it only has two gears. The wide gear range means virtually no overlapping of the gear ratios. Rohloff Disc Speedhub: is one of the greatest internally geared hubs on the market. Shifting is practically unnoticeable. The Rohloff features 14 gears that are equally spaced over a wide spread of ratios, confined within a sealed bearing hub and weigh a similar amount to a typical mountain bike derailleur system. Rear Brake Increase your stopping power and add an extra element of control to your ride with a rear brake. The Avid BB7 Disc break is a quality disc brake and includes the locking brake lever. Lock the brake, exit the trike and leave it without fear of it rolling away.